Jerome Robbins is one of the greatest choreographers in the history of Broadway. Classics like West Side Story, Fiddler on the Roof, The King and I, and Peter Pan are just a few of his shows that are still cherished and performed today. Those and several others – On the Town, Billion Dollar Baby, High Button Shoes, and Miss Liberty – are the focus of this incredible revival of the 1989 musical anthology. Directed by Cynthia Onrubia, who was Robbins’ assistant on the original production of the show, Jerome Robbins’ Broadway is a must-see celebration of the director/choreographer’s work. Full of meticulously rehearsed dance numbers, beautiful orchestrations, and brilliant performances – it would be hard to leave the show without a level of astonishment. The show features a cast of 50 actors, who wonderfully fill the magnificent Muny stage. It begins with an overture, which uniquely showcases the vocal talents of the entire cast as well. When they finally reveal themselves by stepping out from the curtain, it’s an awe-inspiring sight – knowing how many people it takes to put on a musical of this magnitude. And that doesn’t even include everyone behind-the-scenes. Calling it impressive is an understatement. It would be hard to single out every talented actor, as the show is full of stars. Muny favorite Rob McClure acts as a narrator, setting the stage for each show change. And then he hops right into the action, becoming one of the characters. As Pa, he shares a great dance number with Maggie Lakis (Ma) during “I Still Get Jealous” from High Button Shoes. Speaking of that show, which premiered on Broadway in 1947, I’ve never seen it but sure would love to after the incredible number from ACT II. 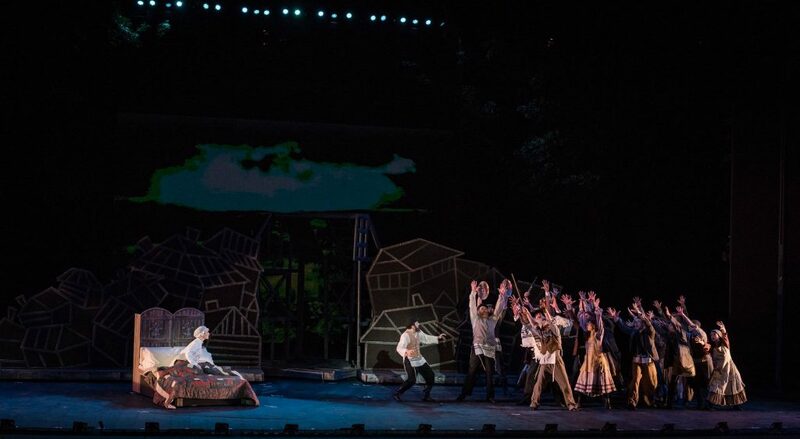 During what is known as “The Bathing Beauty Ballet” (set to “On a Sunday By the Sea”), around 30 people are on-stage running in and out of doors, chasing each other around in some of the most complex choreography I have ever seen. I knew Robbins was talented, but I can honestly say he was a genius for pulling this number off. And the enormously talented cast makes it look easy! West Side Story is one of my favorite musicals of all time. In 1957, Robbins directed the show and won a Tony for his choreography. The 1961 film adaptation would later win him an Academy Award for directing along with Robert Wise. 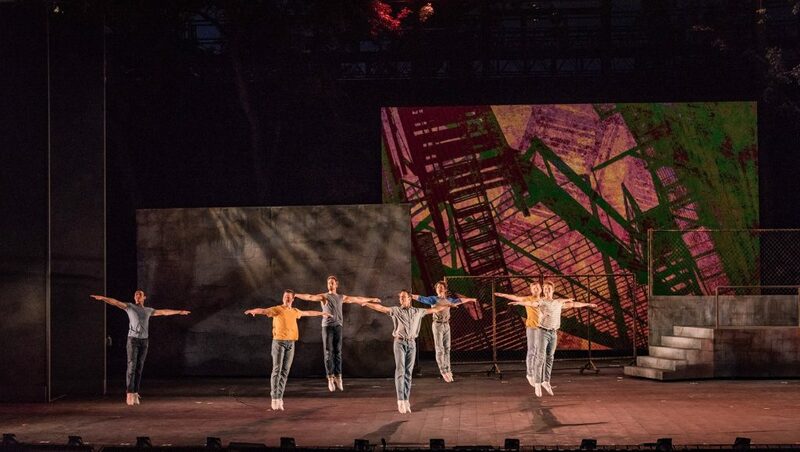 Jerome Robbins’ Broadway closes out ACT I with a suite of the most popular numbers, including the Prologue, “America,” “Somewhere,” and several others. The music, directed by Michael Horsley, sounded phenomenal as ever (and was throughout the entire performance). This is a great showcase of Robbins’ unique street ballet which deservingly won him so many accolades. I fell in love with the show all over again and didn’t want it to end. The second act opens with a mesmerizing staging of “The Small House of Uncle Thomas” from The King and I. Erica Wong is fantastic as Eliza, trying to escape the evil King Simon – played by Peter Chursin. The costumes are gorgeous, thanks to the talents of designer Robin L. McGee. Paige Hathaway’s set design – combined with the lighting of John Lasiter and the sound design by John Shivers and David Patridge – transports the audience into the story, lost in the wonderful immersiveness of the number. The fun continues with “I’m Flying” from Peter Pan (Sarah Marie Jenkins is spectacular as Peter), “Mr. Monotony” (a spellbinding performance by Jenny Powers with dancers Sean Rozanski, Alexa De Barr, and Garen Scribner), and several numbers from Fiddler on the Roof (with McClure as Tevye) among others. “Breathtaking” is a good word to describe Jerome Robbins’ Broadway, yet I fear words cannot do it justice. The production is only a sampling of what the brilliant artist accomplished between 1944 and 1964, which is only the tip of the iceberg. Yet for those who have never had the pleasure of seeing his work on the stage, the show is an extremely rare opportunity to experience much of his magic in one place. And there is no stage grander and suited to house it, than The Muny for the start of their centennial season. 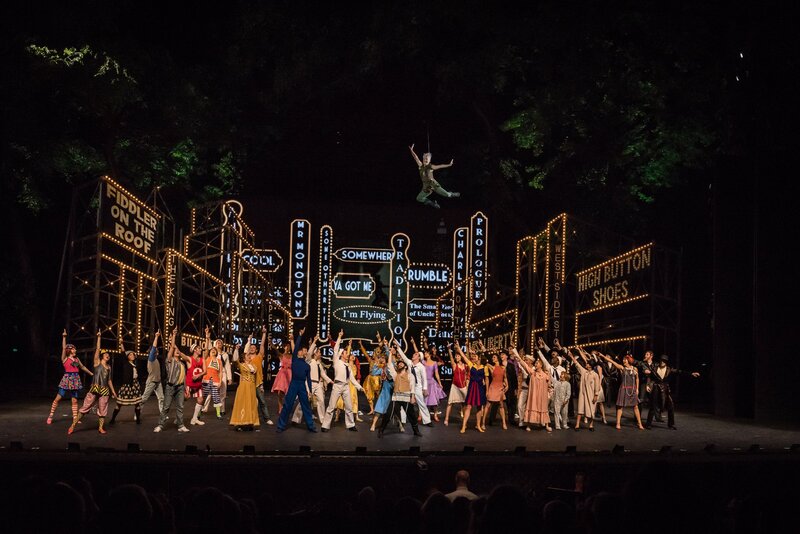 See Jerome Robbins’ Broadway at The Muny through June 17! Tickets range from $15 – $100 and are available at MetroTix. For more information, visit Muny.org.